The Brain trust at MTV just compiled a list of the Top Hottest Rappers in the Game. The list features Kendrick Lamar on top of the list, with 2 Chainz coming in at No.2. The list has been met with a little controversy as Kanye West and A$AP Rocky weren't pleased with their ranking on the list. One artist that has surely made an indelible mark on the Hip Hop world in 2012. 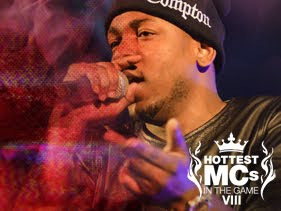 With cosigns from Dr. Dre, and every Nip Hop heavyweight, K.Dot didn't fAil to deliver on promises made with an impressive first week album sales, a Number 1 album which sold over 242,000 in its first week, Hit singles like Swimming Pools and Poetic week, and murdering his features on songs like A$AP Rocky's F*cking problems and 2Chainz's 1 Train. 2012 has been a big year for 2 Chainz, the former Players Circle member was hard to ignore with strong memorable verses on Mercy, a strippers anthem with Birthday song, No Lie, and an amazing hook on f**king problems. The Atlanta native formerly known as Tity Boi has impressed all comers. His debut album 'Based on a T.R.U. Story had debuted at number 1 on the Billboard 200 Album Chart with first week sales of 147,000 and a platinum single, No Lie, in addition to a Grammy nomination for Best Rap Album of the year surely 2 Chainz is well worth his place on the list. The MMG Bawse drops in at number 3 on the list. The Miami native dropped his f studio album, God forgives, I don't, which debuted at number 1 on the Billboard 200, and recording 218,000 in first week sales. The Bawse was behind hits like Diced pineapples, Pop That, Hold me back, Lemme see. And has expanded his MMG imprint to include artists like Omarion. Rockie Fresh and French Montana (a joint deal with Bad Boy records), a partnership with Atlantic records, with successful tours at home and abroad. Nas surely made a heavy impact in 2012, releasing his eleventh studio album, Life is Good, which debuted at number 1 on the Billboard Album chart selling over 149,000 copies, spawning hits like Daughters, Bye Baby and earning four Grammy nominations. October's Very Own, Drake makes his way to the top half of MTV's Hottest MCs in the Game, on the back of strong collaborations with 2 Chainz on No lie, A$AP Rocky on F*cking Problems, Mike Mill's Amen, Rick Ross' Dice Pineapples, and Kendrick Lamar's Poetic Justice, Lil Wayne's Love me and most notably winning the Grammy for his 2011 album "Take Care" . Making him the go to guy for amazing choruses, and in my opinion, the most talented member of the Young Money Cash Money Brothers Group. The Toronto native has also inked a major with the Universal Music group that would see him sign artists to his OVO (October's Very Own) label, and headling his very successful Club Paradise Tour, which made him over $42 million. And also his latest effort, Started from the bottom is currently sitting at number 6 on The Billboard Hot 100. The Louis Vuitton Don drops in in the list in number 7. The year 2012 had been an important year for Yeezy, and his G.O.O.D Music group. Kanye West has kept himself relevant with tours with Jay-Z, the Cruel Summer compilation album that sprung hits like Mercy, I don't Like, New God Flow and Clique and guest apperances with 2 Chainz and Rihanna. It's really hard to argue with his delivery and genius. However, I feel that the no.7 spot is a bit low for Mr. West. 2012 has been a phenomenal year for Harlem native A$AP Rocky. The year 2012 has seen him collaborating with established acts like Rihanna, to drop hit singles like Gold and the massively popular F**king Problems which has long been certified platinum by the RIAA. And crowning it all with his debut album, Long.Live.A$ap which debut at number 1 with first week sales of 139,000, and his own Long Live A$ap tour along with his A$ap crew. One rapper that really took the Hip Hop industry by the proverbial balls has to be Future. His sultry autotune assisted voice on songs such as "Turn on the lights", "Tony Montana", "Same Damn Time" Future has really impressed all comers. And is set to continue his rise with features on hot songs by Lil Wayne, Rihanna. All he needs now is a hot album to put the memories of his disappointing debut, Pluto to rest, and cement his place as one of the hottest MC in the game. Meek Mill has established himself as a household name in the Hip Hop industry with tracks like "Amen", "I'm a Boss" and 'Young and getting it". And his Dreams and Nightmare debuted on the Billboard 200 at No. 2, selling over 165,000 copies in its first week, and charting over 305,000 copies as of January 2013.